C'est dans le cadre magnifique du "Méridien" de Monaco que s'est tenu cette soirée du vendredi 26 mai qui a permis aux jeunes pilotes et aux femmes proches de la F1, d' offrir un défilé, qui fut donc une réussite, comme chaque année. Autour d'un cocktail de bienvenue, les places étaient prises petit à petit, sans oublier le photocall où les personnalités étaient fixées à jamais, pour cette soirée de fête. Le Prince Albert II retrouvait Jackie Stewart et Eddie Irvine avait invité Pamela Anderson, tandis que d'autres invités de qualité et de renommée s'apprêtaient à suivre un programme bien établi. Défilé de mode, présentation des bijoux de Bonato Milano, et de la marque IMPERIALI, pour la vente aux enchères, devant les nombreuses personnalités attirées par les brillances et exposées, avec les autres fabuleux objets de cette vente, comme la montre Rebellion Timepieces. Lors de cette vente aux enchères, d 'autres lots, des plus intéressants étaient proposés et ont fait qu'une somme de 450 000 euros a été récoltée. Entre le trekking dans l'Himalaya, les 9 jours en Afrique du sud, les peintures portraits Pop Art de pilotes comme Ayrton Senna et de stars comme Roger Moore et Marylin Monroe, d'autres œuvres, d'autres artistes peintres, le Caviar, des vacances à Mexico, des créations de Silviya Neri, 4 nuits au château Gaby près de Bordeaux, un pendentif exceptionnel, du Champagne vintage ou devenir membre d'un club privé de sport à Monte Carlo, des photographies de grandes valeurs et Totor, le chien de Stéphane Bolongaro, tout était fait pour une belle réussite de cette soirée plus que mémorable à Monaco et attirer les acheteurs pour une œuvre caritatives. Les couleurs du défilé de jolies femmes, puis la prestation du chanteur Chris Willis et de ses danseuses ont définitivement ravi le public, qui avait répondu présent à cette invitation et qui n'ont pas manqué d'applaudir ces prestations, dont celle du maître de la vente aux enchères, toujours aussi exceptionnelle. A bevy of Formula 1 drivers, international celebrities and Monaco Grand Prix VIPs flocked to the Amber Lounge Monaco Fashion Show on Friday night, to celebrate the start of Formula 1’s most prestigious event, taking place this weekend on the streets of Monte Carlo. In the esteemed presence of His Serene Highness Prince Albert II, Amber Lounge Monaco 2017 welcomed a host of international celebrities, many of whom came to the Principality from the neighbouring Cannes Film Festival. 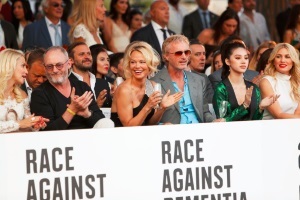 They included American actress Pamela Anderson, model and actress Kate Upton, Lindsay Lohan, Game of Thrones star Liam Cunningham, F1 driver Eddie Irvine, Italian Entrepreneur and DJ Gianluca Vacchi, Miss Vietnam World Australia Jolie Nguyen, Hofit Golan, Fashion Designer Isabell Kristensen and Former Miss France Laury Thilleman to name a few. The excitement didn't end there. Those stars - and more - are set to shine bold and bright at the biggest and best F1 party nights in town: Saturday 27th and Sunday 28th at Amber Lounge. F1 drivers Stoffel Vandoorne, Daniil Kvyat, Esteban Ocon, Pascal Wehrlein, Marcus Ericsson, Charles Leclerc and Marc Gene swapped their race suits for custom tailoring this evening, rocking the runway in Apsley of London and Michael Kors formal wear, in aid of this year’s charity partner, ‘Race Against Dementia’. The Amber Lounge Fashion Show, held at Le Meridien Beach Plaza hotel, is one of the most-watched events of the Monaco Grand Prix weekend and was attended by more than 300 journalists, photographers and television cameras from all over the world. Setting the style note for the evening were show hosts Federica Masolin and Natalie Pinkham, Sky Sports F1 TV presenters in Italy and the United Kingdom, and two of the biggest names in Formula 1 broadcasting. Dressed head to toe in Silviya Neri, the signature designer for the F1 ladies’ evening wear collection, they compered a spectacular show, opening with a jaw-dropping display of SAFiYAA swimwear. Next on stage, Amber Lounge Monaco’s headline music act, Chris Willis, AKA ‘The Voice of David Guetta’, gave a powerhouse performance of his Eurodance hit , "WOULD I LIE TO YOU" as F1 drivers walked on water at the spectacular swimming pool setting. Hot on their heels - quite literally - were the glamorous ladies of F1: Mara Sangorgio of Sky Sports HD F1 (Italy), Giselle Zarur and Claudia Casedemunt of Canal Latam (Mexico); Amanda Davies of CNN (Global); Amanda Smerczak, Adrian Newey’s partner; Tamara Boullier, wife of Eric Boullier; Pedro de la Rosa’s wife Maria, and their three daughters; together with show hosts Federica and Natalie. In signature style, Amber Lounge Founder and Monaco-based entrepreneur Sonia Irvine delivered the final flourish - gliding gracefully down the runway, hand in hand with her charming six-year-old daughter, Katie. They were all dressed in Silviya Neri silk, with pieces selected from her latest collection. Soon, it was time for the live auction, during which generous bidders raised an incredible amount of more than 450,000 EUR for Amber Lounge Charity, Race Against Dementia. The intoxicating atmosphere was heightened by the brand new cocktail Angel Soul from Mexico City, which is the Official Destination Partner of Amber Lounge. FRIDAY 26TH OF MAY GUEST LIST: H.S.H Prince Albert II of Monaco, Sir Jackie Stewart, Pamela Anderson, Kate Upton, Lindsay Lohan, Ross Brawn, Jenson Button, Eddie Irvine, Liam Cunningham, Gianluca Vacchi, Victoria Bonya, Chase Carey, Karen Coulthard, Maria and Pedro De la Rosa, Sheikh Salman al Khalifa Bahrain, Isabell Kristensen, Amanda Cronin, Marquise Roberta Gilardi Sestito and her husband Donato Sestito, Tamara and Eric Boulier, Hofit Golan, Lady Victoria Hervey, Laury Thilleman, Betty Bachz, Daniela Karnuts, Camilla Kerslake, Jolie Nguyen (Miss Vietnam Australia). The Monaco Grand Prix weekend is set to be action-packed both on and off the racetrack, the spectacular street circuit having seen its fair share of thrills and spills over seven decades. The fierce rivalry at the front of the grid can only intensify at a track where pole position is so crucial to race victory. Amber Lounge is the perfect antidote to all that nail-biting, edge-of-your-seat spectating, with two lavish party nights still to come on Saturday May 27th and Sunday May 28th. It’s the place where you can rub shoulders with the drivers as they let their hair down after a tough weekend of adrenaline-charged F1 racing. Saturday Extravaganza: a vibrant concept with over twenty entertainers across DINING & CLUB. International DJ’s, Hip Hop / Burlesque / Club dancers, Saxophonist, drummer as well as our surprise International Act for non-stop entertainment.